KPTA Chapter awards were presented to members during the Chapter Business meeting on April 13, 2019 at the 2019 KPTA Spring Conference in Wichita, KS. The Distinguished Clinical Service Award was presented to Zane Ochs, PT, DPT, OCS in recognition of his professional clinical service to the physical therapy profession including outstanding dedication and compassion toward his patients in the clinical setting as well as toward future clinicians. Congratulations Zane! The Outstanding Physical Therapist Student Award was presented to Kayla Zerr, SPT, a Wichita State University Physical Therapy Student, for her exceptional commitment to service in order to help her peers as well as the undeserved population in her community. Congratulations Kayla! Elections were held for the offices of President, Vice President, PTA Caucus Representative, and Nominating Committee Member prior to the KPTA’s Spring 2019 conference in Wichita, KS. Results were announced at the Chapter Business meeting on April 13th. Camille Snyder, PT, DPT was elected President. Aimee Riegel, PT, DPT was elected Vice President. Deanne Yates, PTA, PhD was elected PTA Caucus Representative. Melissa Dutcher, PT, DPT was elected to the Nominating Committee. Congratulations to these members and thank you very much to all who agreed to be nominated and slated for office! We appreciate your willingness to serve the KPTA! The Kansas Physical Therapist Association had a great day at the Capitol on March 21. We had over 50+ KPTA attendees, heard from the Kansas Department of Health and Environment Secretary Lee Norman, Met with and Photo Op with Governor Laura Kelly, and our members were able to meet legislators from around the whole State. 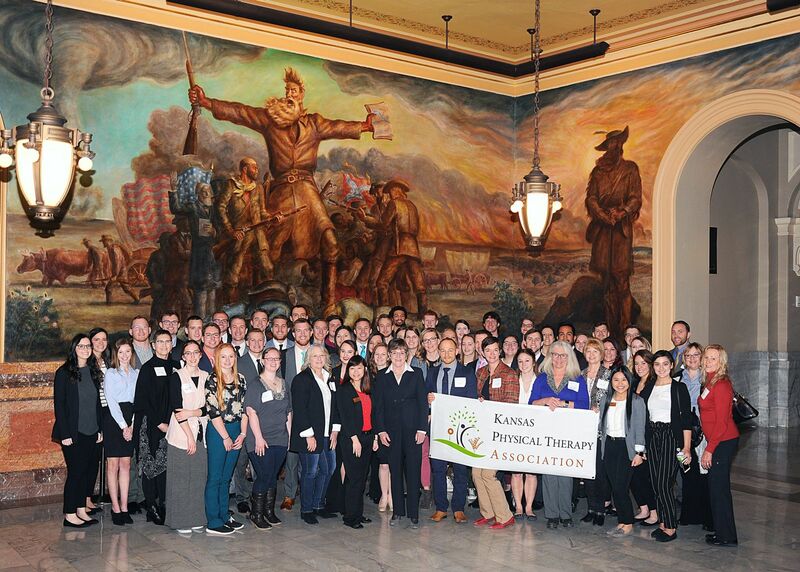 THANK YOU Physical Therapy Students and KPTA members for taking time to visit the State Capitol, join your peers and represent your profession at the State Capitol! Your presence was noted ... all knew that Physical Therapists were in the Building! Our profession needs your help to combat the opioid crisis in Kansas. As PTs/PTAs and members of KPTA you are uniquely positioned for this opportunity to be a strong advocate for patients in combatting this problem. Please help us identify local media partners (TV and radio) encouraging them to show a compelling APTA developed Public Service Announcement (PSA) that helps increase awareness about PT as an alternative to opioid use. Fortunately APTA provides video, print and ready to use social media materials to use with this campaign. They have developed this PSA that we hope all media outlets in Kansas will embrace and integrate into their programming. Please join the KPTA advocacy team TODAY in this important outreach activity. Send an email to [email protected] letting know you will help. We will provide you with the tools and training you need for success as we work together to end the opioid crisis including a complete resource package to guide you through the process and optimize your communications with local media outlets. The Centers for Disease Control and Prevention have stated that physical therapy is a smart alternative to opioids in the management of non-cancer related pain. We need your help to make sure that the Kansas media is aware of the extent of the opioid crisis. Did you know that in 2016 there were 304 of deaths from drug poisoning and 140 were from either prescription drugs or illicit opioids? For those of you with a presence in Greenwood, Clark, Sumner, Woodson and Elk counties, your support in outreaching to media is extremely important as these counties had the highest rates of opioid prescriptions per person in 2017. Want to know important details about your county? Use this interactive map of Kansas counties http://www.preventoverdoseks.org/kpdo_data.htm. Click on “prescription metrics map by patient county of residence” and then “opioid” for the indicator. Why is this important to KPTA? Consumers and other professionals are knowledgeable about expertise and services provided by PTs/PTAs and one of our objectives is that the KPTA will promote the active PT/PTA role in the opioid epidemic. How does this impact my KPTA/APTA membership? In the upcoming 2018 APTA House of Delegates a proposed motion, RC 16-18 Endorsement of Efforts Addressing the Opioid Crisis will be heard. This motion amends a position statement passed in the 2016 HOD that focused on our profession’s support of national efforts. The 2018 motion extends that support to local chapter efforts. The opioid crisis is now being addressed at local levels by governors and state legislatures and in state, county and city health initiatives. Thank you for your time and efforts in this important public health issue.